Last weekend, Lipglossiping reader Charlotte (what a great name!) alerted me to the fact that Debenhams online were charging £35 each for the new Limited Edition Soft Touch Chanel Eyeshadows in Taupe Grisé and Vert Khaki. I informed Debenhams of this last Sunday evening (15th August) and was told that the misprice was indeed a technical error… 3 days later, on Wednesday evening… the error was fixed. If you bought it at the higher price you need to call our Customer Services on 08445 616161 with your order number to sort out refund! So there you have it. If you’ve been stung by this technical error, hopefully you’ll realise and get in contact with Debenhams who will then happily refund you. Charlotte claims that her local Debenhams counter in Ipswich also charged her £35 each for the eyeshadows, though I have no way of verifying this. Perhaps they were following the online pricing? I’m not sure… but it might be wise for Debenhams to get a memo out to their counters to ensure that customers aren’t paying over the odds for the new releases. STAT! I mean sure… they’re pretty, but they’re not THAT pretty. Have you paid over the odds for these new releases or seen your local counter charging more than £19.50 a piece? 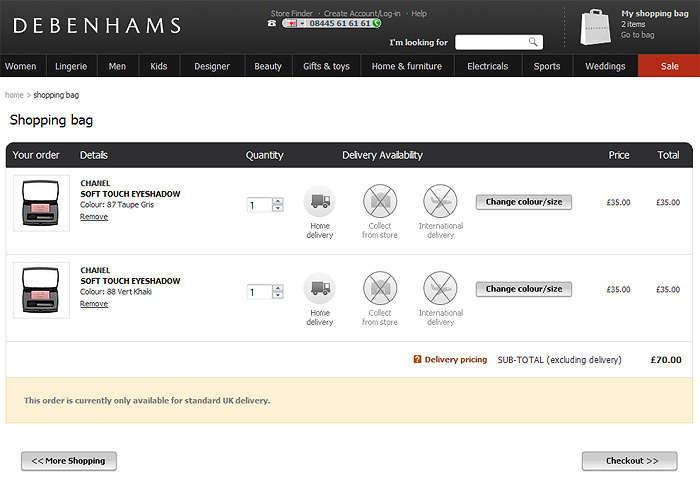 im not even going to tell you how much I hate Debenhams, everything they do is a fcuk up. Wow I have been mentioned in blog land! Just to let you know I approached my counter today and received a refund, no quibbles, although I did complain that being overcharged £31 in total was quite a mistake for such a big company, I can’t help thinking that maybe they were trying to profit from the hype that sounds limited edition collections. I also want to thank Charlotte for contacting customer services and letting me personally know that i could get a refund, I am now trying to work out what to spend it on! Erm, what I don’t understand is how anyone would be so stupid as to pay £35 for a single Chanel shadow in the first place? Surely you would notice it at the check out?! You can blame Debenhams as much as you like and it’s a big mistake on their part, but nobody HAD to pay this higher price! Not everyone is aware of the prices and sometimes people really do just order things whilst distracted – I know I have in the past and done things like picked the wrong shade online. I think calling people ‘stupid’ is a bit unkind and not particularly constructive. I’m not blaming or hating on Debenhams. It’s titled “Public Service Announcement” and I decided to post it when I became aware that refunds would need to be asked for. I don’t have a problem with this situation but I want to make people aware of the situation incase they were affected. No you’re not blaming or hating them, but some of your commenters were. All I’m saying is, people should be more aware of what they’re doing and maybe take some responsibility for their actions rather than blaming others if they make a mistake. Although it was Debenhams fault that they put the wrong price, and people are right to complain, they should’ve been aware of the fact that these eyeshadows cost significantly less usually/elsewhere. It’s just common sense. You have some really valid points Anitacska and I appreciate you coming back to explain them. I just think that perhaps if you’d elaborated on this in the first place it would have been a little kinder to someone who I don’t think deserved to be called ‘stupid’. Anitacska: Wow, that’s a bit harsh isn’t it? Maybe people thought that was the correct price for the eyeshadow? Anyway, re. them not refunding, that’s pretty harsh as it was their mistake but *lawyer head on* caveat emptor and all that. sorry if I caused a fight, but I would like to clarify why I didn’t query it at the till. I buy all my chanel at a counter and not that frequently, however the fall collection had several things I wanted so I hauled it in one go, it included eyeshadows, glosses, blushes and a mascara. As a result of having a decent haul I “stupid” did not even thinking to check what came up on the till, after all I expect chanel to be expensive. It wasn’t till I was surfing the chanel website later looking at other available shades that I might like to look at in future that day that I realised the website had the 2 new single shadows significantly more expensive than the others and that was when I checked my receipt, i paid the same as the website. Until I saw Lipglossipings post saying she paid £19.50 that I realised I might have paid too much. At the time I didn’t think much more than I was silly and should have order online from elsewhere, but i like where possible to swatch before I buy. Lipglossiping did some much welcome research, which enabled me to get a refund! This is not meant to be a witch hunt for debenhams. This post was just a note to people who could like me have unwhittlingly paid far to much purely for not knowing the individual price for each item sold by chanel. Sorry if that makes me less knowledgable to the make up community, but I suspect anyone can make a genuine mistake. wow 35! even the duos cost 29!